Riedon offers the best lead-time in the industry. Average lead-time is 4-5 weeks for wire wound resistors. 1-2 week premium delivery is also available! Resistive technology requires cutting edge solutions for specified needs throughout many types of industries. Surface mount resistors have largely replaced the more traditional "through hole technology" method. This means that the electronic circuit itself has all of the required components placed directly onto it. Printed circuit boards are inherently infused with surface mount technology. Riedon has the capacity to offer either through hole or surface mount technology, depending on customer needs. Many people may not know that both types of technology can be needed on the same board. This is because some larger transformers and heat-sinked components may not be as well suited to surface mount technology. The surface mount may have no wire leads at all making it smaller than the through hole technology design. You can see a good example of surface mount resistors on lots of common electronic equipment. One such example is the USB flash drive. If you look inside the flash drive you can easily see the circuit board and all of its components. On this small device are several surface mounted resistors and chips. 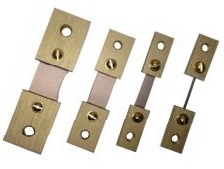 Components designed with surface mount technology may have differing types of leads including balls of solder formed as a matrix, carefully placed short pins or other areas with flat contact. Surface mount technology was introduced in the 1980's, allowing components to become more compact. Surface mount refers to the way the component itself is manufactured. Various terms for surface mounting manufacturing methods have found their way onto the scene since the early 1980's. It may be useful to have a basic understanding of these methods related to machines, techniques, and components as well as the overall manufacturing processes. These surface mounting acronyms may or may not be familiar to you: SMD which means Surface Mount Devices: This incudes all of the surface mount resistors as well as any other electromechanical items requiring a surface mount. SMT stands for the specific Surface Mount Technology, which is where the devices are mounted. This refers to the process of actual assembly and the process used to mount the SMD's. SMA is short for the Surface Mount Assembly. Once the module is assembled, using the technology as directed, the finished component is referred to as the surface mount assembly. SMC is understood to mean the Surface Mount Components, which boils down to the actual components that are needed to complete the technology requirements. SMP is known as the Surface Mount Package, which includes details for all the electromechanical components, required for the (SMD) surface mount device being ordered. The SME refers to the actual Surface Mount Equipment or the manufacturing machines used to assemble the during the SMT process. These industry acronyms can be confusing at first, but they are essential to understating the surface mount resistor technology process.